Dubai: Nearly 50 air-conditioned bus shelters are under construction in Dubai while 10 more are in the pipeline and once completed will bring the total number of air-conditioned shelters in the emirate to 884 shelters. Mattar Al Tayer, Director-General and Chairman of the Board of Executive Directors of Roads and Transport Authority (RTA), said RTA has started constructing the bus shelters in several residential and newly developed areas in Dubai. He also announced that work has started on the construction of a model for two shelters powered by solar energy on a trial base as a solution for shelters in locations off the electric power grid. Solar power would be used to operate lights, air-conditioners and billboards. “The Air-Conditioned Bus Shelters Project is part of RTA’s continuous effort to enhance excellence and leadership drive through undertaking flagship projects in Dubai. It is also part of a master plan for improving public transport, and providing smooth services to bus riders, especially during the blazing summer,” Al Tayer said. Bus shelters in Dubai are used by 1.208 million riders every month, and customers’ surveys indicate that air-conditioned shelters have a very high customer satisfaction rate, Al Tayer said. The shelters being constructed are located in Dubai Investment Park (nine shelters), Dubai Academic City — Aviation College (two shelters), and Higher Colleges of Technology (one shelter). Other shelters are located in Dubai Industrial City, Dubai Internet City, and Jumeirah Lakes Towers. 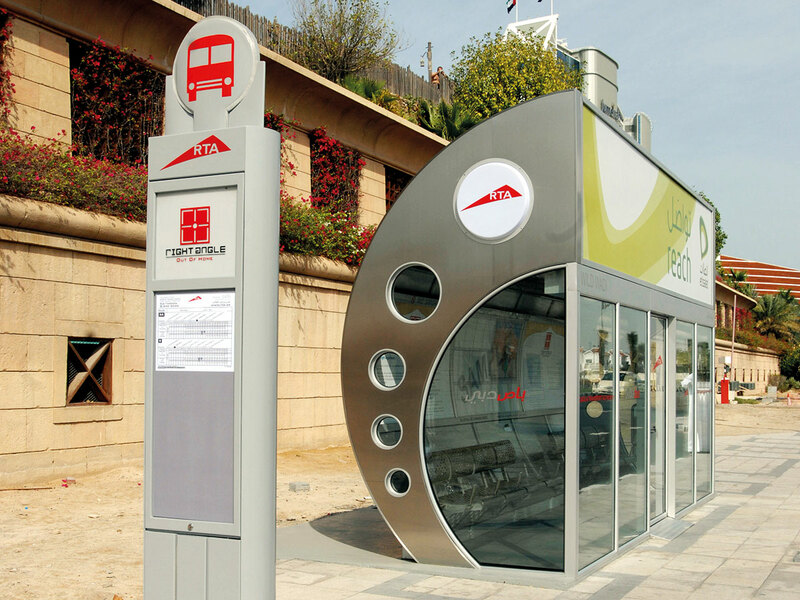 Bus shelters in Dubai are used by 1.208 million riders every month. Over the next few months, RTA will start the construction of 10 other air-conditioned shelters in different parts of Dubai as per the scale of demand of public transport users. These crescent-shaped shelters are of high quality and will have a painting resistant to heat, humidity and dust. Each shelter will have eight seats designed to ensure the comfort of users and can accommodate 13 to 16 people. The design also caters to the needs of People of Determination. The Solar-Powered Shelters Projects is an environmental-friendly option for shelters located in places with no electric power supply. Through the solar power panels, it will be possible to power the air-conditioners, lighting and billboards at the shelter. The project aims to address complaints of riders from the lack of shelters in certain locations, and encourage the use of mass transit means.